Beginning in 1930 Jean Lambert-Rucki, a Polish avant-garde artist, sculptor, and graphic designer became one of the pioneers of Modern Religious Art. Over the course of his career Lambert-Rucki worked in a number of different styles including Cubism, the Tribal Arts of Africa, and Primitivism. Over the course of his career Lambert-Rucki worked in a number of different styles including Cubism, the Tribal Arts of Africa, and Primitivism. 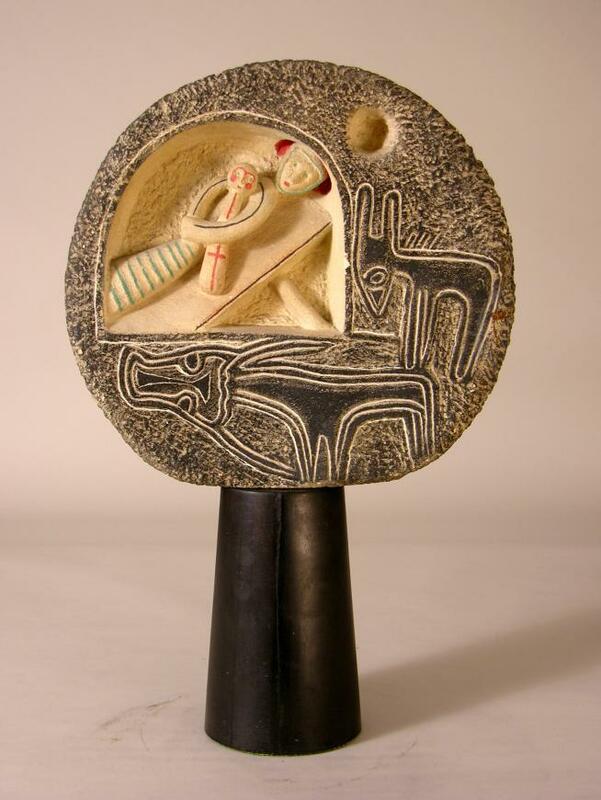 These three influences can be seen in our Nativity and in the vast numbers of sculptures Lambert-Rucki created. The use of granite in our Nativity connotes a certain appealing primitivism as do the very simple figures of Mother and Child whose details are colorfully delineated. The animals outside the cave or stable area are reminiscent of African masks. The artist’s interest in Byzantine art, and especially in mosaics, is reflected in the colorful detailing of the figures. This sculpture reflects the artist’s penchant for combining a singular naivety, tenderness, and last but not least his humor. Lambert-Rucki is considered a very important artist of the late Cubist period as well as the Art Deco Movement, and our example is a special piece that highlights the genius and creativity of this artist.